(Phys.org)—A team of researchers at the California Institute of Technology has used a modified enzyme to provide better anti-Markovnikov selectivity in alkene oxidations. In their paper published in the journal Science, the group describes using an iterative process to modify the enzyme and producing a desired end result. Manufacturers use a variety of chemical reactions to produce goods that consumers desire. One such reaction is used to form an aldehyde and involves oxidizing the end carbon atom—it can be used to create products based on a linear alcohol such as lubricants, cosmetics, flavorings and perfume. But it is a difficult process, and for that reason, chemists have sought a better approach. Such efforts focus on the catalysts that are used because those currently available are not very productive. In this new effort, the researchers report that they found a way to modify an enzyme to use it as a catalyst that greatly improved the productivity of the reaction. The enzyme, a P450 cytochrome (called P450LA1, quite naturally) was subjected to directed evolution, an iterative process in which mutations occur and the results are screened for positive attributes. The iterative process was conducted through 10 rounds (resulting in 12 mutations) using styrene as a substrate. The resulting enzyme was called aMOx, and it was found to be quite productive, able to catalyze 3,800 oxidation reactions, as compared to just 10 using other catalysts. The researchers chose P450LA1 because it has been used as a catalyst for other similar type reactions and a prior research effort showed that under certain circumstances, aldehyde emerged as a side-product. More work is required to see if the technique is adaptable to manufacturing processes, but the researchers express confidence that it will someday be used to create a host of aldehydes, alcohols and amine products in a wide variety of applications. The work also represents a step forward for replacing conventional catalysts with biocatalysts because it is believed they will eventually work better in flow systems. 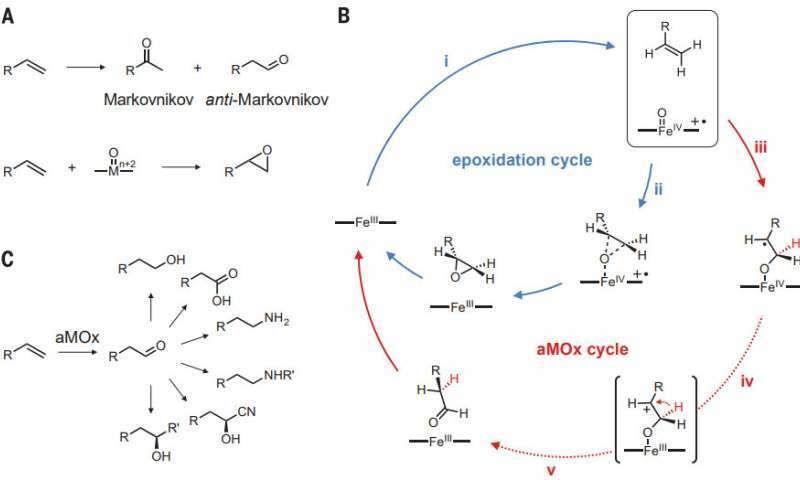 Catalytic anti-Markovnikov oxidation of alkene feedstocks could simplify synthetic routes to many important molecules and solve a long-standing challenge in chemistry. Here we report the engineering of a cytochrome P450 enzyme by directed evolution to catalyze metal-oxo–mediated anti-Markovnikov oxidation of styrenes with high efficiency. The enzyme uses dioxygen as the terminal oxidant and achieves selectivity for anti-Markovnikov oxidation over the kinetically favored alkene epoxidation by trapping high-energy intermediates and catalyzing an oxo transfer, including an enantioselective 1,2-hydride migration. The anti-Markovnikov oxygenase can be combined with other catalysts in synthetic metabolic pathways to access a variety of challenging anti-Markovnikov functionalization reactions.